Nearly all bible commentators emphasize the importance of understanding the historical, cultural and grammatical aspects of any text of scripture. As has been said, “A text without a context is a pretext.” In other words, to assume one can understand what God has revealed through those who present his word — prophets, poets, visionaries, apostles — without knowing the context is a presumption. To really understand God’s word, it’s essential to know something about who wrote it and to whom, what was actually said and what it originally meant, when, where, and why it was written. I was thrilled when Rabbi Josh sent me a copy of his new (April 2014) book. Like most believers, I know very little about the Book of Jude and every time I read it, I know even less. That’s one of the reasons I was looking forward to reading (and reviewing) Rabbi Josh’s book: to get some answers. Another reason was to read a commentary on such a difficult Christian text from a wholly Messianic Jewish point of view. As Rabbi Rubin said in the quoted text above, most Christian scholars, clergy, and the people who sit in the pews believe they have a pretty good handle on understanding what the Bible says if they can just get into the original language a little bit and understand something about the author, the audience, and the situational context. The Book of Jude is unusual. Far more than a simple treatise, it is a letter that the author never intended to write, and yet eventually considered important (v.3). It is the product of “popular Judaism,” reflecting the interests of the common people rather than the religious elite, which the author shares along with his readers. It is also steeped in contemporary Jewish literature and tradition, drawing heavily upon Jewish apocalyptic ideas of Jewish understanding of morality (v. 5-7)”. This is what most Christian Bible students, teachers, and scholars miss when they consider what the author was thinking and what he wanted the readers to comprehend: Jewish tradition, midrash, lifestyle, and apocrypha as it was understood by Jews in the mid to late first century CE in Roman occupied Israel and the diaspora beyond. According to R. Josh, Judah (the more likely name for the author of “Jude”), was chastising some false teachers who had entered the ranks of the Messianic community, likely a primarily Greek speaking Jewish group in the diaspora, who were promoting erroneous and dangerous ideas about salvation and antinomianism (lawlessness), including the idea that being saved by grace alone (“hyper-grace”) means that it is impossible to lose said-salvation, no matter how much you sin (I recently mentioned this concept in my commentary on Romans 8). To counter these false teachings, Judah used a number of examples to whom these false teachers may be compared. However, these examples for the most part, are drawn not from events we directly read about in the Bible, but from Jewish tradition and midrash. But Michael the archangel, when he disputed with the devil and argued about the body of Moses, did not dare pronounce against him a railing judgment, but said, “The Lord rebuke you!” But these men revile the things which they do not understand; and the things which they know by instinct, like unreasoning animals, by these things they are destroyed. Christian Biblical literalists will assume this dialog between the Archangel Michael and Satan actually occurred as presented because it’s recorded in Judah’s brief epistle, but Judah was drawing from Jewish tradition, not the written Biblical text in order to create his analogy. Specifically, this transaction is in the apocryphal text of the Assumption of Moses (also known as the “Testament of Moses”). Without understanding anything about the Jewish apocryphal writings, and more importantly, how the author wanted his readers to understand the reference, we won’t have the ability to grasp the meaning of this example in the epistle. It is this perspective that R. Josh brings to the table, so to speak, with his “Jude” book, a unique interpretive matrix one does not find commonly within the Church. Although fairly short (just 100 pages, reflecting the brevity of Judah’s letter), this book is packed with very useful interpretations and viewpoints on the imagery employed by the writer and its likely impact on the letter’s Jewish readers (and the objects of his criticism, the false teachers). It would be easy, since the book is so short, to write an extensive, almost page-by-page review of this text, but I don’t want to give too much away. While I found the revelations contained within to be interesting and compelling, I didn’t find the content earth-shattering or a “game changer” as such (at least for me). Besides what I’ve already mentioned, what I took away from this book was the clearing up of a lot of the mysterious and even “mystical” illustrations used by Judah. Once R. Josh pulled back the curtain and let me peek inside, I “got” what the letter writer was attempting to say. I should mention that this book is part of the Lederer Books Messianic Commentary series which includes Matthew Presents Yeshua, King Messiah: A Messianic Commentary by Rabbi Barry Kasdan and James the Just Presents Applications of Torah: A Messianic Commentary by Dr. David Friedman (I wasn’t able to locate an additional book in this series online, Rav Sha’ul’s Exhortation to the Ephesians on Jewish-Gentile Relations). I highly recommend Rabbi Josh’s book Jude: Faith and the Destructive Influence of Heresy for anyone who wants a clear understanding of Judah’s (Jude’s) brief but complex epistle, and especially for those who are interested in seeing the Bible through a Messianic Jewish lens. R. Josh’s book is a fine addition to anyone’s library of Biblical commentary. A few weeks ago, I heard that Dr. William Varner of Master’s College will be in my area this coming October to present an all day teaching on the Epistle of Jude. It might be interesting for me to attend and listen to what he has to say filtered through R. Josh’s informative text. 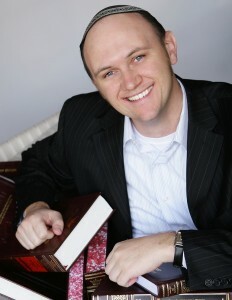 Rabbi Joshua Brumbach is the Senior Rabbi at Ahavat Zion Messianic Synagogue in Beverly Hills, CA. He’s an accredited Jewish educator, has studied in various Jewish institutions including an Orthodox yeshiva in Europe, and is ordained by the Union of Messianic Jewish Congregations (UMJC) and the Messianic Jewish Rabbinical Council (MJRC). He holds a MJS in Rabbinic Writings from the Messianic Jewish Theological Institute (MJTI), and a BA in Ancient Near Eastern Studies from UCLA. To find out more about Rabbi Josh, visit his blogspot Yinon Blog. Thank you again for taking the time to read through the book and for your excellent and detailed review. You’re quite welcome Rabbi Josh, and congratulations on the book. Looking forward to future literary contributions from you.